Marlow’s Tavern menu prices at your fingertips. Marlow’s Tavern is a bar & grille chain that offers a classic setting for an American pub fare & sports on TV. Marlow’s Tavern features the “Best of the Best” in American tavern fare served in a modern atmosphere. The menu offers a diverse combination of classic dishes that are updated and elevated to a higher level. Marlow’s Tavern has a warm neighborhood yet contemporary feel. It currently has 6 locations in Florida and 17 locations in Georgia. Below are the latest Marlow’s Tavern menu prices. Fans of Marlow’s can sign up to receive regular updates regarding offers, promotions, events and special invitations. Sign-up is free and can be completed on Marlow’s website. Each Marlow’s location works to give back to their local community by supporting artists, farmers, and causes. Organizations such as Speical Olympics and American Cancer Society have benefited from Marlow’s support. Marlow’s Tavern has a complete set of meals that cover light and creative starters, crisp cool salads, big bar sandwiches, classic tavern burgers, tavern favorites comprising of chicken and seafood entrees, sidebars, kids’ meal and sweet desserts. Marlow’s Tavern utilizes a black and white motif to create a sleek fashionable look that is accented by black and white photographs and Chicago-style brick walls. A neighborhood “feel” is accomplished through an open kitchen that invites customers to observe the chefs at work. Communal tables in the bar and large cozy booths are in place to create a bar setting. Several flat screen plasma TVs are discreetly incorporated to allow guests to enjoy a variety of shows while they dine. Marlow’s is a meeting place for all seasons with spacious patios that are open all year round to allow guests to enjoy cocktails and tavern specials under the stars. 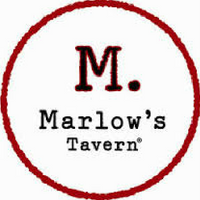 For more information about Marlow’s Tavern, visit their official website.